The European Technology and Innovation Platform on Bioenergy (ETIP Bioenergy) is an industry-led stakeholder platform that brings together relevant actors from academia, industry, and civil society, engaged in the development of sustainable bioenergy and competitive biofuel technologies. One major task of ETIP Bioenergy is to address the technical and economic barriers to the further development and accelerated commercial deployment of bioenergy technologies for the widespread sustainable exploitation of biomass resources. 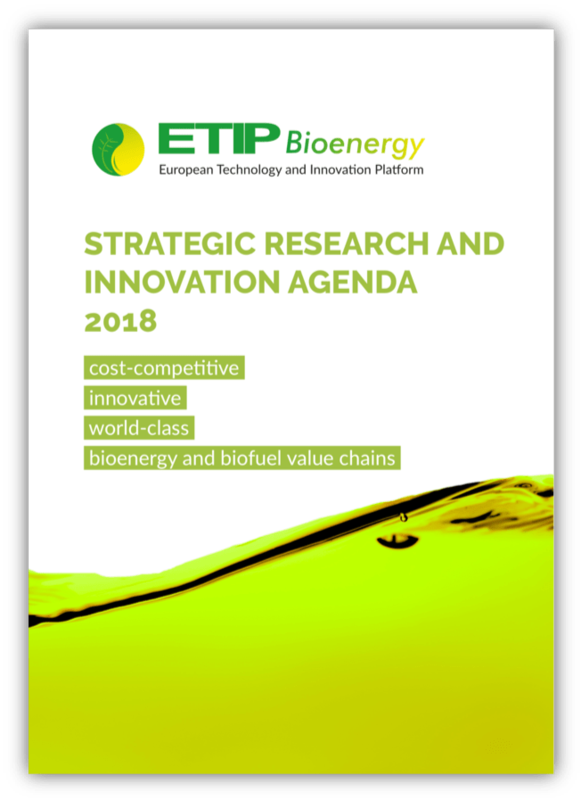 ETIP Bioenergy published its ‘2018 Strategic Research and Innovation Agenda’, as an update to its 2016 Agenda. “Ensure a coherent national implementation of the EU biofuel legislation. Relevant, transparent and science-based data and tools for practical implementation of sustainability requirements in the legislation and market place should be further developed. Support resource efficient supply following a system approach (including legal and financial mechanisms and measures). The key priorities for commercial biofuel technologies are to improve environmental (GHG, energy balance, water, inputs…) and economic performance and bring flexibility as integrated biorefinery. The Strategic Research and Innovation Agenda 2018 can be downloaded here. The SET-Plan Action 8 Implementation Plan can be downloaded here. The SET Implementation Plan Action 8 focusses on Bioenergy and Renewable Fuels for Sustainable Transport. “[It] describes the Research and Innovation (R&I) activities that need to be implemented in order to achieve the strategic targets adopted in the SET Plan Declaration of Intent (DoI), agreed in December 2017 by the representatives of the European Commission services, SET Plan countries and stakeholders most directly involved in the respective sectors. In order to capture the major segments of Bioenergy, the Implementation Plan describes targeted implementation approaches for Renewable Fuels for Sustainable Transport (automotive and aviation fuels, as well as hydrogen produced from renewable sources), Bioenergy (biosolids, bioliquids, and biogases) and intermediate bioenergy carriers. Owing to the complexity, but also to the versatility of the value chain Feedstocks >>> Conversion >>> Intermediate Carriers >>> Final Product, the IP describes 13 activities. 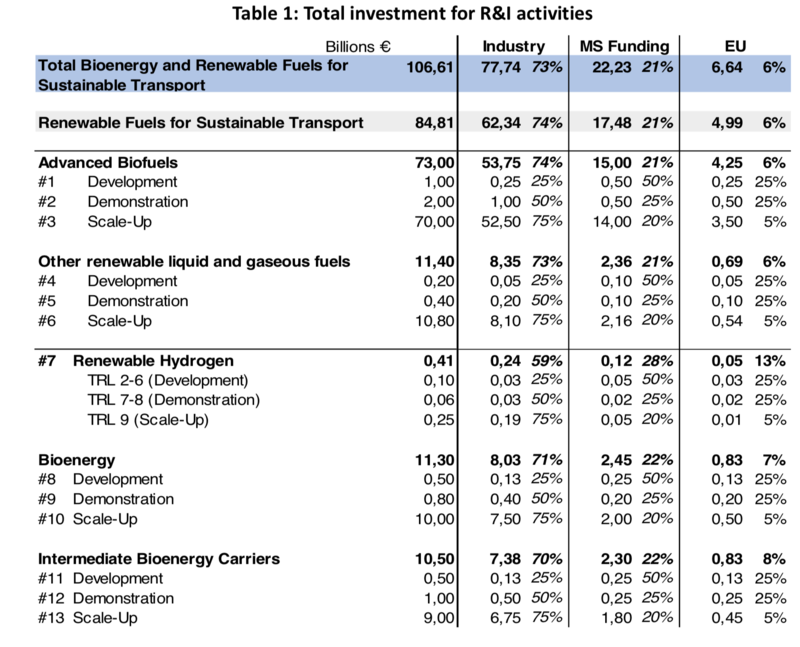 They are structured along Technology Readiness level (TRL)1 and consequently divided into Development, for Demonstration and Scale-up according to the table 1: Total investment for R&I activities below. The estimated volume of investment for deployment is 2,29 Billion €, whereas 104,31 billion € is foreseen for demonstration and scale‐up activities.